Greenwich Council’s director of education fled a public meeting about plans to close Blackheath Bluecoat school this evening after being barracked with cries of “get out” by students. The meeting had been called as part of a consultation into proposals to shut down the school on Old Dover Road, Blackheath, which is suffering from dwindling pupil numbers. But Gillian Palmer and her staff walked out of the meeting after an anti-cuts campaigner took to the microphone to demand they leave so parents could organise their own action against the planned closure. Headteacher Barnaby Ash tried to reconvene the meeting, but Ms Palmer and her team had left the building, to the dismay of many of the staff and parents. “This is not going to save this school,” Mr Ash told parents. Before the meeting suddenly ended, Ms Palmer came under fierce criticism from parents, staff and students, with many hailing recent big improvements in exam results. She said the school had only attracted 81 out of a possible 180 students this year, and the council’s education budget could not afford to maintain its deficit of £1.5 million. “We had four targets for this school - to improve teaching, improve standards, to make it more popular, and see an increase in its rolls,” she explained. While teaching and educational standards had improved markedly, she said, the school was still saddled with a poor reputation which deterred parents from sending their children there. But many speakers praised the quality of the teaching, and accused Greenwich Council of not backing the school by not encouraging parents to send their children there. 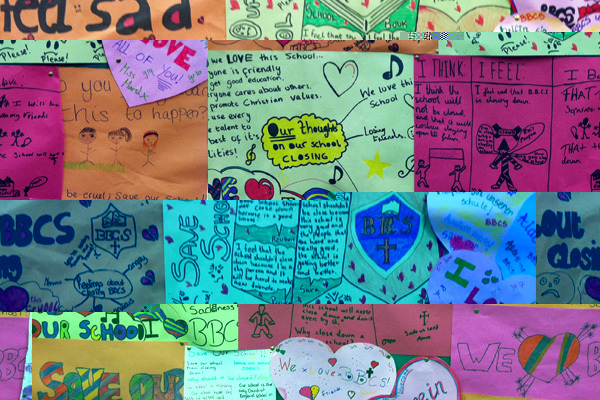 One student said the school was “like a family”. National Union of Teachers member Helmut Heib, of Deptford, challenged Ms Palmer to publicly withdraw the closure proposal, before calling on the council officers to leave. 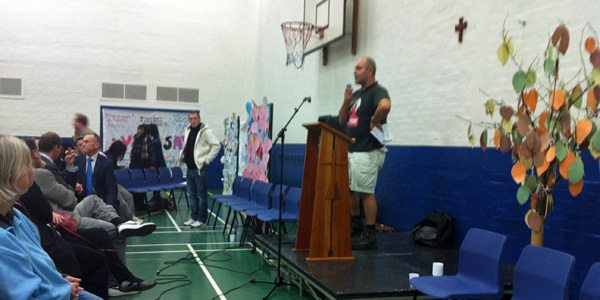 “If you’re not prepared to withdraw this proposal, all those in favour of asking you lot to leave, so we can organise a campaign to stop the closure of this school, raise your hands,” Mr Heib, who is also a member of Lewisham Anti-Cuts Alliance (LACA). “Get your stuff and get out,” he continued as a sea of hands went up, and Ms Palmer’s team left to cries of “get out”. Mr Heib then took the microphone to call for volunteers, before headteacher Mr Ash took the microphone back in the hope that the council team would return. But he added: “I sat there for an hour and fifteen minutes, and everyone was in favour of keeping the school open. I could see that at least 20 parents had already left, so I asked if they were prepared to reconsider, and they said, quite categorically, no. He added: “Those people who are unhappy should have another meeting and I won’t turn up, and we’ll see where we are at the end of that - which, as you can see, is a draft proposal to close Blackheath Bluecoat school. While a Greenwich Council-funded school, 29% of Blackheath Bluecoats students come from outside the borough, with most of those from Lewisham. LACA has previously been involved with a campaign to stop Deptford’s Tidemill school becoming an academy, and an occupation of New Cross Library. Blackheath Bluecoat can trace its history back to Greenwich’s Blue Coat School for Girls, which opened in 1700 and was based on Point Hill for much of the 20th century. In 1959, it merged with the Blackheath and Kidbrook School, based on Old Dover Road. A formal consultation process on closing the school will begin on 8 November with the publication of a notice in council weekly Greenwich Time. The final decision will be made by Greenwich Council’s cabinet on 12 January. No councillors were present at this evening’s meeting. London mayor Boris Johnson has called for control of London’s overground rail routes following a power failure which saw hundreds of Greenwich line passengers stranded on a viaduct this morning. The mayor spoke as he unveiled a £36m sponsorship deal for the cable car between the Greenwich Peninsula and the Royal Docks, which will now be officially called the Emirates Air Line. But the launch came as Greenwich’s existing transport network was crippled by the closure of the A2 due to a dangerous building at Deptford Bridge, and the failure of the Southeastern train at Deptford. Passengers were stuck on the train for two-and-a-half hours until it was “rolled” back to Deptford station. London-bound services were diverted via Lewisham throughout the morning. 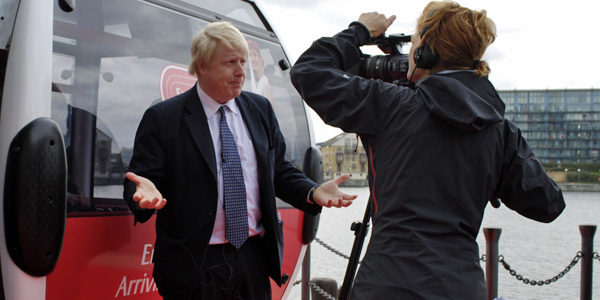 “The failure on the overground rail is something we could well sort out if only they would give us control,” Mr Johnson told greenwich.co.uk. Transport for London has control of just one of the capital’s mainline operators, London Overground, which was launched by his predecessor Ken Livingstone in 2007. “It’s a continual bugbear that you have passengers who feel frustrated because their journey into work isn’t comfortable from the south-east. We’re not empire-building, but we just think we could help if we’re involved in those franchises. “Cable theft is a big problem now and we think that the systems being put in place to protect passengers against disruption are inadequate. 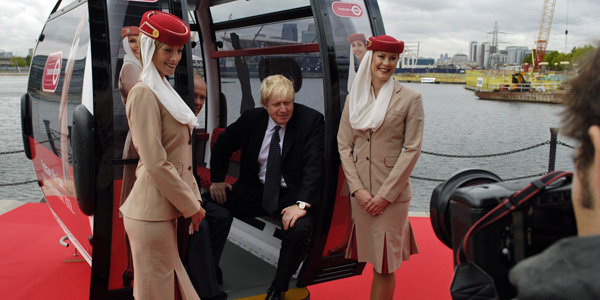 The £36m, ten-year deal, will see the cable car stations named Emirates Greenwich Peninsula and Emirates Royal Docks, with the 34 gondolas painted in the airline’s red livery. Inside, the seats feature a bus-style moquette. The service - which will have a capacity of 2,500 people in each direction each hour - will appear on the Tube map, but fares and operating times are still not confirmed. 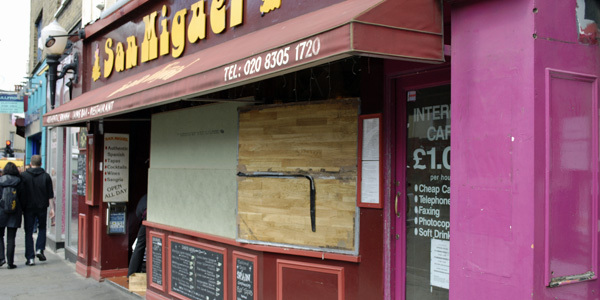 It is due to open next summer, although TfL is not guaranteeing it will be ready for the Olympics. But the sponsorship cash falls well short of the £59m total budget of a scheme the mayor originally hoped would be entirely funded by private finance. TfL is applying to the European Regional Development Fund for an £8m grant which would “more or less wipe out the construction costs”, Mr Johnson said. As for the remaining funds, the mayor said most of it was set aside for contingencies that hopefully would not be needed. “Even in the worst case scenario, there will be a revenue stream from the cable car in terms of fare revenue for TfL which would help to defray that cost very substantially. TfL’s managing director of underground and rail services, Mike Brown, said: “I was on site yesterday and work is well under way - the contractors are doing a great job from what I can see so far. Our plan is to get it up and running next summer, but it was never designed as being critical for the Olympics. But obviously we want to get it in service as soon as we can. Asked if the cable car car was the best priority for Greenwich’s transport problems, Mr Brown said: “TfL is investing a huge amount of money in the delivery of Crossrail, which of course will carry huge volumes of people, many more than the cable car was designed for. “I think this is a useful addition. It does give us some very useful, specific capacity for the route from Greenwich Peninsula to the Royal Docks, and I think that’s going to be a fantastic addition to TfL’s overall infrastructure. Mr Brown added that the Thames Path by the O2 would reopen “as soon as possible”, when the main piling work by the cable car’s south tower was complete. The towers are currently being prepared for installation, while over the next few weeks work will start on the stations. But at City Hall, Liberal Democrat assembly member Mike Tuffrey was less impressed. "Transport for London admit that this sponsorship deal only meets 80% of the construction cost. This leaves many millions of pounds worth of funding to be found from TfL's budget,” he said. “At a time when fares are set to rise by well over the rate of inflation people will be asking why the Mayor has failed to live up to what he had promised and ensured the cable car was entirely self financing." 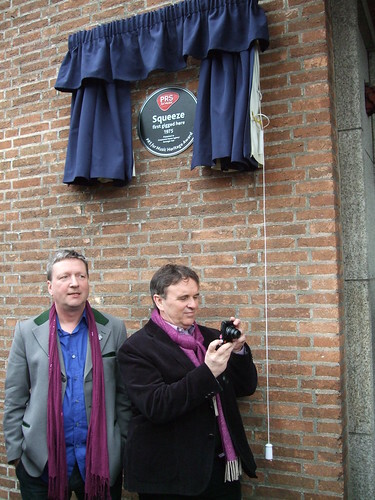 Squeeze went back to their Greenwich roots on Tuesday when a plaque was unveiled at the Borough Halls, the venue for one of their first concerts. Founding duo Chris Difford and Glenn Tilbrook joined the rest of the band in Royal Hill, at what is now the base of the Greenwich Dance Agency. The fledgling band played there in 1975, ahead of a career which has saw them score worldwide fame with hits such as Up The Junction, Cool For Cats and Take Me I'm Yours. It is the fourth plaque to be erected by rights body PRS For Music at the sites of major bands' early gigs. The first - marking a Dire Straits show in Deptford's Crossfields Estate - was unveiled last year. Tilbrook, who still lives in Charlton, told greenwich.co.uk how the band cut its teeth in venues around Greenwich and Deptford. "Our first gig was at the Northover - between Catford and Downham - which is long gone. "We used to play at Hardys Free House every week. We'd also play the Deptford Arms, the Bell - in Greenwich around the back of the church - all places were we could get residencies when we were coming up. "After we left the Deptford Arms, that's when we started touring and stopped doing the local things so much, and then you get propelled into a different world, that it doesn't seem possible to come back from. Now we're in a world where we play big places and small places and I like that - lots of mixing and matching." Tilbrook recently played a residency at the Anchor and Hope pub in Charlton with his other band, The Fluffers - "more anarchic and free-spirited" than his main band. He said we wanted to help new acts get the same opportunities Squeeze did. "I've always stayed in this area and I love this area - I don't think I'll ever leave. But I've seen it change, and it's now harder for bands to get started. I'm trying to get something going at the Anchor and Hope." Squeeze will be playing the Isle of Wight Festival in June, with a UK tour at the end of the year which will include a date at the O2's Indigo venue on 9 December. "I'm not interested in doing anything other than stuff that's really fun and good - Squeeze is back to being that, and that's such a good place for it to be," he said. Greenwich Council's newspaper Greenwich Time was branded "appalling" and "blatant propaganda" by opposition councillors at Wednesday night's full council meeting. The weekly was criticised in a Westminster debate earlier this month, with it and other council publications coming in for attacks from politicians and publishers of local newspapers, who claim it damages free speech and is hurting their business. Conservative councillor Dermot Poston called it "an appalling piece of paper", adding it was "a shocking indictment" of the council. "Ask anyone in this borough who reads it - not that anyone does - and they'll tell you," the Eltham North member said. Brian Woodcraft (Lib Dem, Middle Park & Sutcliffe) said the paper, which was relaunched as a weekly in 2008, was "blatant propaganda". "It contains a full week's TV listings, which is totally inappropriate for a local authority newspaper," he continued, questioning the cost of employing distributors to deliver it weekly, when previously it had been delivered fortnightly alongside the established local freesheets, the Mercury and the News Shopper. However, council leader Chris Roberts (Labour, Peninsula) said it was more cost-effective to publish Greenwich Time once a week. "It's cheaper weekly than fortnightly, and I'm happy to provide figures to any member who asks for them," he told the meeting. He said the decision was made to distribute Greenwich Time separately because the council had received "too many complaints" that the newspaper was not being delivered, and residents were missing out on important items of public consultation. "Neither the Mercury nor the News Shopper reach the whole borough," he added. Addressing charges that the newspaper was propaganda, Cllr Roberts said: "Hammersmith and Fulham Council has its council tax plastered on its lamp posts - well beyond anything that goes on in this borough." Referrring to criticism from News Shopper editor Richard Firth - who called the newspaper "a self-serving propaganda sheet" - Cllr Roberts called for an "honest debate" on the issue, reeling off a list of local newspapers published by newspaper group Archant, including The Docklands, a version of which appears in Greenwich as The Peninsula. "I don't think the views of the Archant publishing house somehow go unreported," he said. However, the News Shopper is published by Archant's rival Newsquest, part of US newspaper giant Gannett. Nigel Fletcher (Conservative, Eltham North), complained that Greenwich Time routinely ignored opposition councillors' views, even on non-controversial matters such as Greenwich becoming a royal borough. "Our views were represented in three of our local media; the Mercury, the News Shopper, and greenwich.co.uk; but the one local newspaper which neglected us was Greenwich Time. "It was slightly absurd that a photograph of the leader of the council should have been on the front of Greenwich Time and not one of the Queen." He said it "fully vindicated" his party's pledge to scrap the paper if it took power at May's elections. Greenwich council taxpayers are set for a freeze in their bills after councillors voted through this year's budget proposals. Council leader Chris Roberts said he had "no desire to slash and burn" public services, citing investment in transport, anti-crime measures, housing and children's centres, adding the cashflow plan was strong enough to deal with any government cuts after the general election. "Whatever is thrown at us by central government over the next few years, the people of Greenwich will expect us to be prepared," he said. "It is a budget which protects our essential services, and does not mortgage our futures." With an eye to the council's own election in May, he said his Labour group had provided "stable and secure financial management for more than a decade". Conservative leader Spencer Drury said freezing the budget seemed "the right thing to do". But the Eltham North councillor questioned a sum of £3.7 million which was counted as cash to be held in reserve, but he said looked as if it had actually been allocated to services including continuing weekly black bin collections and covering extra costs in social care. "These things are essentials," he said, "not things we have any choice over". If that sum of money really was available, he said, then it should be returned to council tax payers "who are suffering too". Cllr Roberts said he wanted to keep the extra sum of money aside in case the relevant departments needed extra cash for those services. Council tax bills will not be finalised until after February 10, when London Mayor Boris Johnson's budget will be settled. He is also planning to freeze his part of the bill. Greenwich Council could buy a sailing ship to commemorate becoming a royal borough in 2012, Conservative culture spokesman Nigel Fletcher told the meeting. Councillors from all parties welcomed the announcement, which was made earlier this month. One idea, he said, would be to purchase a sailing ship to commemorate The Great Harry, a warship built at Woolwich for Henry VIII. Cllr Fletcher said it was worth noting that royal connections were spread across the borough, and a ship would recognise Woolwich's contribution. "It's an idea that could have a range of benefits, particularly for our youth," he said. "There is a challenge to us to answer what becoming a royal borough means in real terms. "It's up to us to use this to secure real benefits across the borough. There should be a Jubilee legacy to go with an Olympic legacy." Greenwich will be the first royal borough with a "significantly diverse" population when it is awarded the honour in 2012, council leader Chris Roberts said. "I have always felt the royal element of the borough has been underplayed," he said. "Even those who declare themselves to be not tremendous royalists say how proud they are. It's an incredible honour." Cllr Roberts said discussions would start soon on just what the honour, awarded to mark the Queen's Diamond Jubilee, would actually mean for the council, from possible changes to the council's coat of arms to putting the new borough names on street signs. "There will be protocols to follow - I've been up to my eyeballs in them - but it will be up to us what to do, in consultation with civil servants and Buckingham Palace," he continued. "I never thought I'd quote Margaret Thatcher, but 'rejoice, rejoice, rejoice'." Long-serving Conservative Dermot Poston also spoke of his pride in seeing Greenwich's diverse population honoured, adding that in 1968, the borough had been turned down for the honour by then-prime minister Harold Wilson. 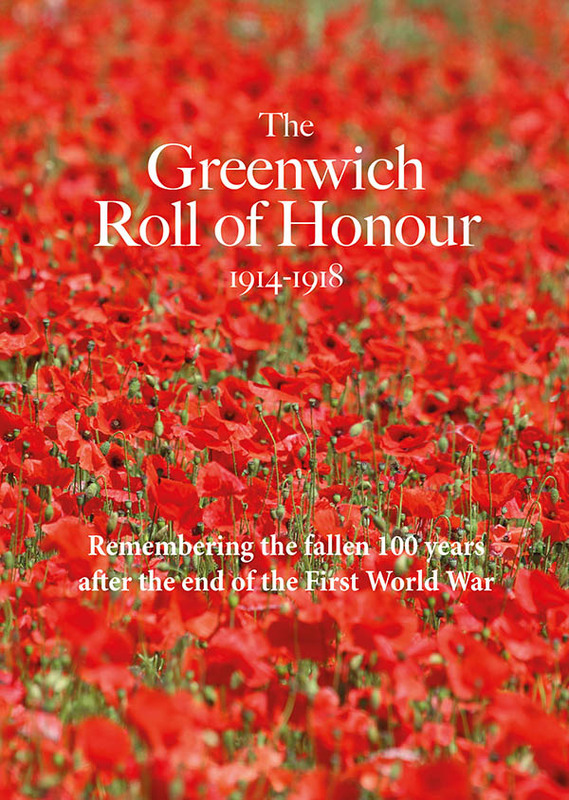 Councillor and historian Mary Mills (Labour, Peninsula) said Greenwich and Woolwich's royal connections had contributed to many of the borough's industries, adding that the honour recognised "all sorts of ordinary people going way back". Chris Roberts added that he had been touched by letters from people about the honour, adding: "My personal favourite is from a lady who wrote, 'I'm just waiting for the first journalist to knock it.'" Greenwich Council has said it wants to join a scheme which will enable it to co-ordinate roadworks in the borough, after a year which has seen serious disruption on Greenwich roads. Works by Southern Gas Networks and Thames Water have caused traffic to grind to a halt through Greenwich town centre, while Charlton and Blackheath have also been seriously affected by a water main replacement programme. The issue was highlighted by greenwich.co.uk's Andrew Gilligan in November after it emerged the council had not joined a Transport for London scheme, under which utilities have to get permits from local authorities before they dig up roads. Deputy leader Peter Brooks told last night's Greenwich Council meeting he wanted the borough to join the programme. In a written answer to Liberal Democrat councillor Brian Woodcraft, who asked why Greenwich was not part of the scheme, he said: "I am very keen for Greenwich to participate in this scheme, and I hope the trial will be expanded for us to be able to do so very soon." However, he not answer why the council had not joined the scheme, and Cllr Woodcraft did not press him on the issue. Lewisham and Bromley councils are involved in the TfL programme, which is due to come into force next year. A petition signed by 1,000 users of Greenwich foot tunnel demanding that closures be kept to a minimum when it is refurbished was presented to the council by Liberal Democrat member Paul Webbewood. The river crossing, together with its sister tunnel at Woolwich, is due to be refurbished by 2012, with regular users fearing lengthy closures. Council leader Chris Roberts told the meeting a contractor had been appointed to carry out the works. "We're discussing what work needs to be done and what the hours will be," he said. "Then we can advise residents and businesses on arrangements for both tunnels." Greenwich Council confirmed it would respect John Roan School governors' decision not to move to a new site on Greenwich Peninsula. Blackheath Westcombe Conservative councillor Alex Wilson asked if a timetable had been set out for works to improve John Roan's existing sites on Maze Hill and Westcombe Park Road. But children's services cabinet member Jackie Smith said the proposals were still in the "developmental stage". "It is too early to be definitive about completion dates, but will will want to ensure that the project is progressed as quickly as practicable." Conservative leader Spencer Drury criticised the council for not giving an update on works at Charlton Lido, which is being converted into a diving centre. Earlier this year his party colleague, Kidbrooke with Hornfair councillor Graeme Coombes, presented a 222-strong petitioning demanding the reopening of the lido for the summer season. It had been closed in anticipation of leasing the lido out to private firm Open Waters Investments, which is due to re-open the pool by summer 2012. But the lease was not signed until 14 August, leaving the lido empty for the summer. Responding to the petition, the council said it would have taken leisure operator GLL two weeks to mobilise its staff, and that opening hours at another centre would have to be cut to staff Charlton Lido. Cllr Drury called the reply "disappointing". "I hoped there would have been an update on whether work has started," he told the meeting. But Olympics and culture cabinet member John Fahy said he saw no reason to doubt that the revamped lido would open on time. If you think your street would benefit from having some new trees, then Greenwich Council wants to hear from you. The council is spending £4.8m on planting 2,012 trees in the borough to mark the Olympics, with planting due to take place next winter. In response to a public question from the Greenwich Environment Forum's Anna Townend, Olympics and culture cabinet member John Fahy told the meeting the council was looking for places to put the trees in. "We've been consulting with residents for a number of weeks, particularly at our Great Get-Together events," he said. Cllr Fahy added that he did not think that a new woodland would be created with the trees. Greenwich commuters will finally be able to use Oyster pay-as-you-go for rail journeys from 2 January, after years of negotiations between Transport for London and the capital's private rail operators. But there's a sting in the tail for some rail passengers, with cheaper off-peak tickets withdrawn for those who don't use Oyster cards, and higher fares for all in the evening rush hour. Many local passengers have been using Oyster on local rail services for some time, but because they have Travelcards loaded onto their tickets. Now all passengers will be able to use the smartcards to pay for individual journeys, just as Tube and Docklands Light Railway users have done for the past six years. On the Greenwich line, this means the cards will be as valid as far out as Slade Green, on the edge of zone 6. From 2 January, passengers who don't use Oyster cards will be charged a flat rate of £2.40 from Greenwich and other zone 2 stations to London Bridge, Waterloo East, Charing Cross or Cannon Street, with a return costing £4.30. Those travelling from Maze Hill or Westcombe Park, in zone 3, will be charged £3.10 single, or £5.30 return. But passengers who do use Oyster cards will be charged cheaper rates, with all journeys being charged as singles. From Greenwich, passengers for central London will have to pay £2.10 if their journey takes place in the morning or evening rush hour - between 6.30am and 9.30am, or 4pm-7pm. If their journey avoids those times, or is at weekends, then they'll be charged £1.70. Oyster card holders from Maze Hill or Westcombe Park will pay £2.60 for a peak journey, or £2 off-peak. The new system also means passengers can combine rail and Tube/DLR journeys. If their journey does not include Zone 1, it's at no extra cost. Someone travelling from Maze Hill to South Quay DLR via Greenwich would be charged £1.80 in peak hours, £1.50 at other times - the same fare as Maze Hill to Deptford. But there's an extra £1.10 added for journeys through zone 1 - so Maze Hill to Goodge Street will cost £3.70 or £3.10 single. A cap will apply on fares, so passengers making different journeys during the day will find they pay no more than the appropriate rate for a one day Travelcard. For people using paper Travelcards or season tickets, it's business as usual. However, the Oyster deal will not make travel as convenient as some users might like. Passengers with Travelcards who need to travel outside their zones will be expected to get a free "Oyster Extension Permit" from a ticket machine or ticket office, or Oyster shop, before they travel to a National Rail station. So someone with a zones 1-3 Travelcard will need to get a permit before travelling to Abbey Wood, in zone 5, for example. However, permits can be picked up weeks or months in advance, and will stay on Oyster cards until they are actually used. Gold Card holders - who have annual Travelcards - will still have to buy paper tickets to get their usual one-third discount on tickets outside their zones. And all passengers wanting to travel to Dartford or deeper into Kent will need to buy a paper ticket as normal. As part of a separate agreement, Thames Clippers river services have already started to accept Oyster pay-as-you-go tickets, offering a 10% discount on normal cash fares, while Travelcard holders will get a 30% discount. A £5.80 single ticket from Greenwich or QEII piers to central London will be reduced to £4.80 with Oyster PAYG, or £3.55 with a Travelcard. Residents in historic almshouses in west Greenwich have been left in "despair, shock and sadness" by news of their possible closure, councillors heard last night. Tenants in Queen Elizabeth College, Greenwich High Road, have been told they may have to leave under plans by its owner, The Drapers' Company, to redevelop it. Local councillor Maureen O'Mara presented a petition, signed by 140 people, to Greenwich Council at a meeting on Wednesday night. Some 70 residents live in the almshouses, which opened in 1818 to house the "poor elderly people" of Greenwich. 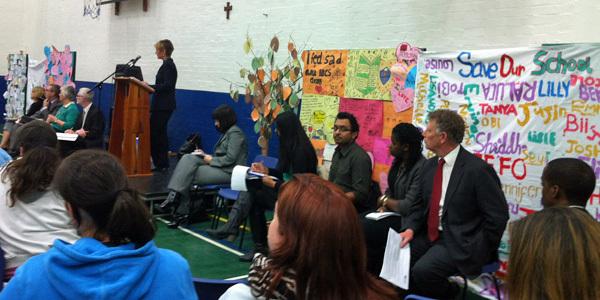 More recently, it has been open to residents from both Greenwich and Lewisham boroughs. Tenants were under threat of being moved to "destinations unknown" by the livery company, Cllr O'Mara (Labour, Greenwich West) said. "They are in a state of despair, shock and sadness," she added. "The decision was made with no reference to either the local MP or local councillors. "We know the council has no influence over the decision, but we hope the oxygen of publicity will make The Drapers' Company think again." The Drapers Company told greenwich.co.uk that it was in regular contact with councillors and Greenwich & Woolwich MP Nick Raynsford. 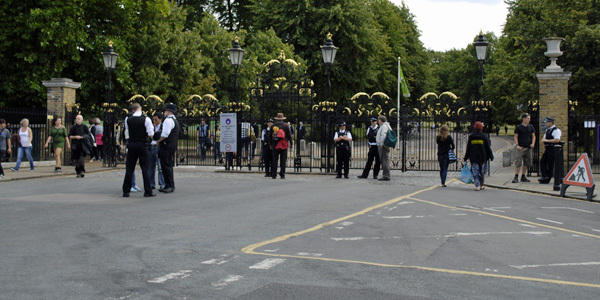 No firm decision had been taken to close Queen Elizabeth's College, clerk Alistair Ross said, but the City livery company hoped to eventually build new almshouses elsewhere to replace the Greenwich site and its other homes in Southwark and Tottenham. 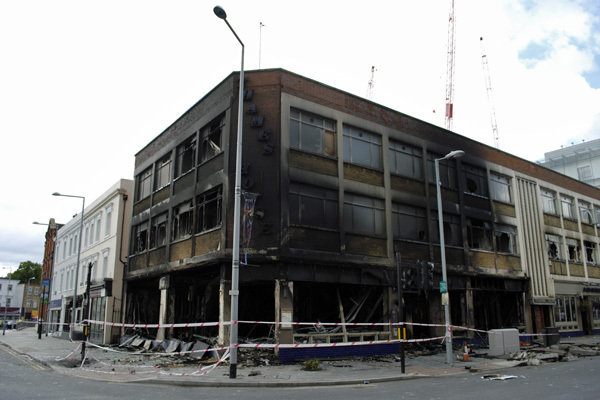 Redeveloping the current site was "unlikely but had not been ruled out". "As soon as a decision is made and plans formulated the residents and borough officials will be informed and consulted, however, it is likely that the whole process will take a considerable time," Mr Ross added. A 13,000-strong petition against Olympic equestrian events in Greenwich Park gathered by campaigning group NOGOE was also presented to the council, this time by Blackheath Westcombe Conservative councillor Geoff Brighty. Organising body LOCOG is due to submit the planning application for a temporary stadium and other measures next month. Cllr Paul Webbewood (Lib Dem, Middle Park & Sutcliffe) attacked coverage of the 2012 Games in council newspaper Greenwich Time, saying an issue earlier this month had "made the council look disreputable". 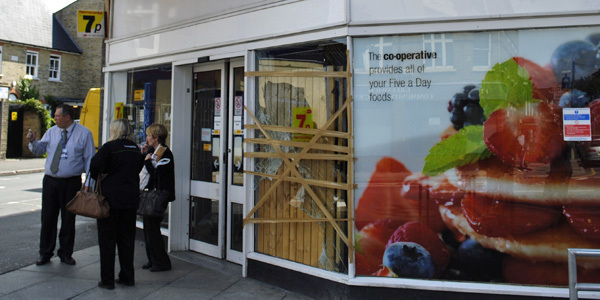 But council leader Chris Roberts (Labour, Peninsula), dismissed the criticism. "I hope there will be a full and frank discussion on what LOCOG actually submit, and not on what people think they are submitting," Cllr Roberts said. Councillors from all three parties threw out the possibility of Greenwich switching to a system of having an elected mayor like neighbouring Lewisham. All London boroughs were required by the government to hold a consultation on the issue, but only 20 residents replied to Greenwich's call for responses, with 14 of those backing the current system where the council is led by a leader and cabinet. Cllr Roberts said that despite the low number of responses, "we are some way off the worst - one council only had one response". Westminster politicians should leave local councils to to decide how to run themselves, he continued, adding that the tradition of having a ceremonial, non-partisan mayor representing the council would be lost under the different system. "Having a civic mayor is like parliament saying, 'let's have a president and abolish the monarchy,'" he said. 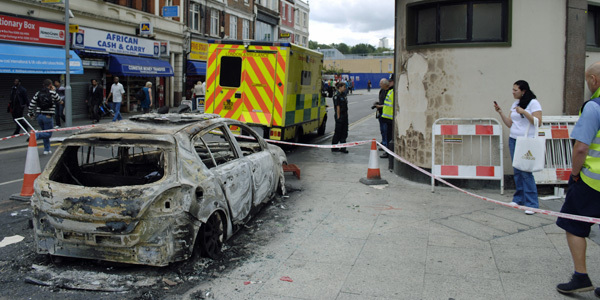 Conservative leader Cllr Spencer Drury (Eltham North) said sticking with the current system was "the least bad" option. Lewisham has had an elected mayor, Sir Steve Bullock, taking most of its key decisions since 2002. Greenwich Council's £12 charge for collecting bulky household rubbish was a "very good deal", insisted neighbourhood services cabinet member Maureen O'Mara. The fee was introduced for non-council tenants two years ago, and Liberal Democrat Cllr Paul Webbewood said he thought it was leading to a rise in fly-tipping. Last month, Labour councillor Janet Gillman told a residents' group in Charlton that she would be pressing for a review of the policy. But Cllr O'Mara defended the system, adding that residents could get rid of up to three items for their money. "Bexley Council charges £25 for the same service," she added.